The (NEW) OLEX returns to your grey hair the natural and original color. It is a product that can be used by men as well as women who desire to get the young look that was lost with the age. Some white hair in early ages can give charm and elegance to the air, however, if they are in many quantity it gives place to an aged look. For this reason, thousands of people, no matter the age, had discovered that the (NEW) Restoring Olex inverts the change color process of the hair, always keeping its young appearance. To understand the (NEW) Olex action, we explain how and why the hair becomes grey. Why does the hair become grey? The hair is constituted of proteins. On the proteins are included some determinative factor that is responsible for the color of the hair called melanine. The different colors of the hair are connected with different types of melanin and its amounts. As time goes by the levels of melanin decrease, turning the hair grey. This will increase as time goes by. For the majority of the people the process starts with only some strings of hair. Eventually, the gray color will become predominant. When melanine disappears completely, the hair will become all white. How does the (NEW) OLEX work? It works as a natural chemical of the hair, producing a pigment that acts as if it was melanin that existed in the hair. The product works in combination with the proteins of the hair to gradually return the natural color of the hair, inverting the grey hair process. 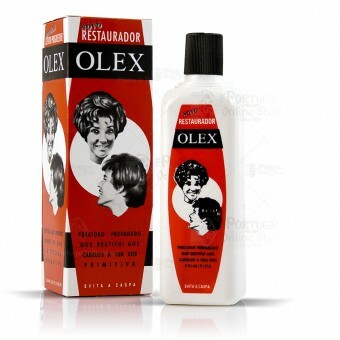 The more regularly you use the (NEW) OLEX, more pigments will be placed in the string of hair. So that in a natural way the color of your hair will become darker. The (NEW) OLEX works in any color of hair, because who controls the process and the desired color is you. With the (NEW) OLEX you hair will seem natural. If you observe in close range, you will notice that your natural hair is not of one single color but with different tonalities and shades. This natural mixture of colors is made by the melanin. How to apply the (NEW) OLEX? Wash your hair with a good and soft shampoo (shampoos with conditioners, treatment shampoos, soaps or toilet soaps, leave vestiges in the hair that retard the development of the shade). Dry it completely before the application. Shake the bottle before and during the aplication. Place a small amount in the palm of the hand, then apply the product for all the extension of the hair (not in the scalp). Apply more product, if necessary, until the hair is slightly wet, rubbing it very well. It does not have necessity to fill with paste. Comb it and wash your hands after the application. If you want to you can dry the hair with the hair drier. Apply the (NEW) OLEX daily, in the morning, until getting the desired color. To keep the color two or three weekly applications will be enough. Keep OLEX in a cool and dry place, out of solar exposition. After each use, close your package well. It is normal that the remained residues in the bottleneck become darker. Keep this product out of children´s reach. Do not use to colour eyelashes, eyebrows, moustache, or hair on parts of the body other than the scalp. Prevent any contact with the eyes. Do not use on cut or abraded scalp. Wash your hands well after the application of the (NEW) OLEX. This product have not been tested in pregnancy and breast-feeding, therefore we do not recommended is use.